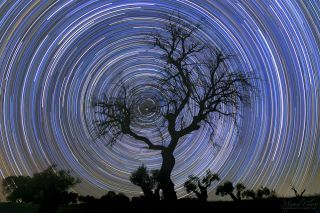 This photo shows a 4-hour sequence of star trails captured from the Nature Park of Noudar in Portugal's Dark Sky Alqueva Reserve. Miguel Claro is a professional photographer, author and science communicator based in Lisbon, Portugal, who creates spectacular images of the night sky. As a European Southern Observatory photo ambassador, a member of The World At Night and the official astrophotographer of the Dark Sky Alqueva Reserve, he specializes in astronomical skyscapes that connect Earth and the night sky. Join Miguel here as he takes us through his photograph "A Colorful Universe Revealed in the Earth's Motion." When we look up at the night sky, it can be difficult to distinguish the color of each star with our own eyes. But if we record a long-exposure image, star trails can reveal much of our colorful universe. We can see a lot of different colors in the star trails, like blue, white, yellow and orange. Each color is directly related to the type and temperature of each star. The hottest stars glow blue, while the coolest can have an orange-reddish color. To capture this view, I used a Canon 6D DSLR camera with an ISO setting of 1250. This medium-value ISO is better for preserving the color of the stars. I captured 30-second exposures with the camera set to "sequence mode," and this image combines 4 hours of exposures. Capturing long-exposure images like this requires a steady tripod and a cable release to avoid shaking the camera.